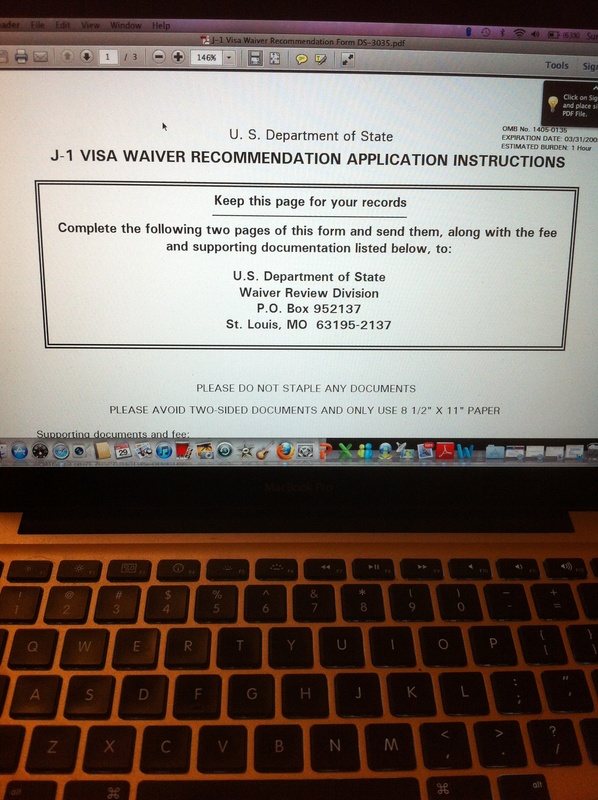 We have had some recent interest in J-1 Visa Waivers. Here is the situation, and below find some of the possibilities. You are a J-1 Visa Exchange Student. Your duration of stay is coming to a close, and the deadline for your departure is fast arriving. You have made close friends, a significant other, maybe even a home here in the U.S., and the dreaded two year away period is looming. In two years a lot can happen – friends grow apart, couples separate, memories fade. Sometimes, it feels, absence does not make the heart grow fonder. If this situation sounds familiar, there may be some options to help you stay, or at least not have to stay away for two years. Request by a designated State Public Health Department. Your initial step may be the easiest: just ask. The No Objection Statement is a declaration by your own government that it has no objection to you not returning to your home country to satisfy the two year requirement AND no objection to the possibility of you becoming a lawful permanent resident (an “LPR”) of the U.S. According to the USCIS, your home country can just say it’s ok to not come home. If your home country’s government issues a “No Objection Statement” through its DC embassy to the Waiver Review Division, you may be able to waive out of your home stay. You can also try to have a designated ministry in your country send the NOS to the U.S. Chief of Mission, Consular Section at the U.S. embassy abroad. If you want to start up the NOS process, go to the USCIS website (www.uscis.gov) and download the revised DS-3035, have it filled out and submitted to the Waiver Review Division along with any requisite fees (last checked it was $215). You should be contacted by the Waiver Review Division and given a case number and instructions to contact the consular section of your embassy in D.C. to request that a NOS be sent to the Department of State on your behalf. The USCIS will let you know if you were granted or denied the waiver, usually after about 8 weeks. Maybe the NOS process did not work for you. Maybe leaving would create a familial disaster in the U.S. Maybe going home would be disastrous to your physical well-being. Before you apply for asylum or TPS, you may wish to fill out the I-612 Application for Waiver of Foreign Residence Requirement. The I-612 may be available on the grounds of persecution or exceptional hardship to your U.S. citizen/ LPR spouse or child. To determine whether the I-612 Waiver applies to you, ask yourself two questions: 1) will I be persecuted upon return to my home country based on my race, religion, or political opinion? ; and 2) do I have a spouse or child that is a U.S. citizen or lawful permanent resident? If the answer to either question is yes, you may have a good argument for an I-612 Waiver. You may wish to quickly call an immigration attorney in your area to determine the details of your eligibility. You may also wish to look up Section 212e) of the Immigration and Nationality Act to familiarize yourself with the law on the subject. Jus type “Immigration and Nationality Act” into the search box on www.uscis.gov. There is a link to “(Legal Code)” at the bottom of the USCIS page on the INA law. If you are eligible for these latter two categories, you probably already know it, because a U.S. agency you are already working at is already requesting your prolonged stay. The State Public Health Dept. Request is for foreign medical graduates who obtained exchange visitor status to pursue graduate medical training or education. These med students must meet three (3) requirements: 1) have an offer for full-time medical work; 2) agree to begin work within 90 days; and 3) execute a contract to keep working full time for at least three (3) years. These requirements are no small potatoes. The Interested U.S. Agency Request is for those working on a project for or of interest to a U.S. agency. If the agency thinks your leaving would hurt U.S. interests, the agency itself may request a waiver for you. The Bureau provides an online application, a clarification survey, status checks, data change forms, and help creating your statement of reason. I was recently asked whether a person in the U.S. as an E-2 treaty investor employee could somehow “transfer” his or her E-2 visa to a different company; perhaps to a company that is in no way affiliated with his or her present company. The answer is, as is often the case, maybe. Yet, the express law from the CFR does not appear to unambiguously prohibit such transfer. A treaty investor or employee may only work in the activity for which he or she was approved at the time the classification was granted. However, as regards E-2 transfer to parent or subsidiaries, an E-2 employee may also work for the treaty organization’s parent company or one of its subsidiaries as long as the 1) relationship between the organizations is established; 2) subsidiary employment requires executive, supervisory, or essential skills; and 3) the terms and conditions of employment have not otherwise changed. Thus, it appears that you can also work for a company related to your present company. Unfortunately, that may not be an option or the desired goal. If your goal is to work at an unrelated but qualifying E-2 company, you may have a few choices. One option that I have seen discussed is to apply to change from E-2 to B-1 and then back to E-2 again. This may buy you time, particularly if you are leaving your initial E-2 company and have not secured new status. Another option is to do a direct change of status where your new company petitions an E-2 for you. The express law on point may leave room to apply for a change of status from E-2 at Company A to E-2 at unaffiliated Company B. As already discussed above, the Code of Federal Regulations, 8 CFR 214.2(e), states that “a treaty employee may engage only in employment which is consistent with the terms and conditions of his or her status and the activity forming the basis for the E treaty status”. Notwithstanding, pursuant to 8 CFR 214.2(e)(8)(iii), prior Service approval must be obtained where there will be a substantive change in the terms or conditions of E status. In such cases, a treaty alien must file a new application on Form I-129 and E supplement, in accordance with the instructions on that form, requesting extension of stay in the U.S. In support of an alien’s Form I-129 application, the treaty alien must submit evidence of continued eligibility for E classification in the new capacity. Alternatively, the alien must obtain from a consular officer a visa reflecting the new terms and conditions and subsequently apply for admission at a port-of-entry. Pursuant to 8 CFR 214.2(e)(8)(vi), if an application to change the terms and conditions of E status or employment is approved, the Service shall notify the applicant on Form I-797. An extension of stay in nonimmigrant E classification may be granted for the validity of the approved application. The alien is not authorized to begin the new employment until the application is approved. Finally, pursuant to 8 CFR 214.2(e)(8)(vii), an unauthorized change of employment to a new employer will constitute a failure to maintain status. Thus, the Code appears to contemplate change of employment to a new employer, albeit rather ambiguously, and applying for permission for the same through an I-129+E Supplement. I have found some notes in the USCIS files discussing how Section 214.2(e)(8) does permit change of employment to an unaffiliated company within the U.S. Moreover, the fact that working for subsidiaries will not be deemed to constitute a substantive change, pursuant to Section (8)(ii), indicates that the substantive change provisions of (8)(iii) contemplate working for non-affiliated companies. Changing specific employers, so long as requirements (such as nationality and percentage interest) were maintained, may not run afoul of other E-2 employee express requirements either. For example, the employee must intend to depart the U.S. upon the expiration of E-1 or E-2 status, and such would remain the same independent of the particular company involved. Having an acquaintance with the express code is at least a first step to providing a foundation for your E-2 endeavors. Should you wish to change companies and seek legal counsel on the matter, most immigration attorneys will provide a consultation free or for a limited fee to discuss your case in more detail. In a recent Removal Proceedings Appeal, an Egyptian citizen successfully appealed an Immigration Judge’s denial of her application for asylum. Her appeal was based on worsening conditions in Egypt, particularly for the Christian community. The IJ in that case stated that evidence presented did not establish a pattern or practice of persecution against the Christian community in Egypt (the woman was beaten unconscious, her son nearly kidnapped, she received threatening calls at home and discrimination at work). Moreover, the IJ indicated that the evidence did not show that the Egyptian police expressed an unwillingness or inability to address the Egyptian citizen’s reported abuses. The appellate court remanded the case back to court to reconsider the asylum application. In particular, the Court found that the IJ may have imposed an unreasonable expectation for the Egyptian citizen to establish the exact basis for her underlying abuse. Importantly, the Court held that a persecutor may have several motives for harming a victim and proving the exact reason for the past or feared persecution may be impossible in some cases. Thus, such inability may not bar an asylum application. The Court ordered the IJ to review whether the Egyptian citizen’s mistreatment could form a viable asylum claim due to her religion or other protected ground. The Egyptian woman’s asylum claim was based on her testimony that she was an active member in a religious organization, known as Lost Lambs, that assisted Christian girls who had been abused by Islamic jihadists. The motivation of the persecutors can be proven by testimonial evidence, supporting documents, and corroborative background evidence. The Court also ordered the IJ to provide a clear and explicit analysis of the Egyptian citizen’s well-founded fear claim. Thus, if you are involved in a similar asylum application during removal proceedings, you may wish to ensure that your testimony on the statutory central reason for asylum is given full consideration and weight by the immigration judge. Also keep in mind that an IJ’s failure to give such proper consideration may be grounds for an appeal. The Immigration and Nationality Act (the “INA”) Section 208 provides for the authority to apply for asylum; exceptions to such authority; conditions for granting asylum, including eligibility, the burden of proof and exceptions; asylum status and termination; and the asylum procedure, including consideration of asylum applications. Section 208(b)(1)(B)(i) states that an asylum applicant must establish that one of the INA’s statutory grounds was or will be at least one central reason for the claimed persecution. These statutory grounds are race, religion, nationality, membership in a particular social group, or political opinion. Testimony of the person applying for asylum may be sufficient to sustain the above burden of proof, even where such testimony has no corroboration. INA Section 241 provides for the detention and removal of aliens ordered removed. Section 241(b)(3) discusses the restriction on removal to a country where an alien’s life or freedom would be threatened. This rule states that the Attorney General may not remove an alien to a country if the Attorney General decides that the alien’s life or freedom would be threatened in that country because of the alien’s race, religion, nationality, membership in a particular social group, or political opinion. However, this restriction does not apply if the Attorney General decides that the alien was involved in similar persecution of individuals, the alien is a danger to the U.S. community; the alien is believed to have committed a serious nonpolitical crime outside the U.S.; or the alien is believed to be a danger to U.S. security. Those individuals who are considering applying for asylum would be well served by reviewing the law on asylum, particularly the full provisions of INA Section 208 and 241. The full text of the INA is available online for free. You can go to www.USCIS.gov and type in “INA” in the search box. It was recently announced that adjustments have been cut off for China-mainland and India EB-2 with priority dates on or after August 15, 2007. That’s right, the announcement is that no further EB-2 visas will be authorized for these China and India applicants. In February, 2012, the official visa bulletin announced that nationals from India and China could file for I-485/EAD/AP as long as their priority dates fell on 12/31/09 or earlier. EB2 waiting time had purportedly been cut by have, from 4 to 2 years. The reason allegedly given by the Department of State was the low level of new I-485 filings. In other words, these economically booming countries were providing internal outlets for their citizens with advanced degrees and exceptional abilities. Compare the discussion on NPR yesterday regarding China’s vision of the U.S. and the complexity of the two countries’ relationship. The debate centered on whether China’s government considered the U.S. as a country already in decline or a country that had peaked but would start its decline in approximately 10 years. The report was titled “Strategic Distrust”. Among the noted the asymmetries between the U.S. and China, the report indicated that China sees the majority of U.S. international actions as an attempt to frustrate China’s assumption of global power. Query how the USCIS’s immigration policies towards China play into this strategic mistrust. Juxtapose immigration court decisions in 2006 with immigration decisions in 2012. You might recall the 2006 case of Gao v. Gonzalez (2d Cir., 2006), wherein the Court held that women sold into marriage in China should be considered a Social Group. There, a Chinese woman sought asylum and Convention Against Torture protection after her parents allegedly sold her into marriage at age 19 to pay off debt. Initially the immigration judge denied asylum and CAT protection, indicating that an intra-familial dispute was not grounds for asylum. However, the Second Circuit Court held that the Chinese woman belonged to a particular social group requiring protection. Citing widespread human trafficking in China and the Chinese government’s failure to combat the problem, the Court overturned the immigration judge’s ruling against asylum. You may also recall a case regarding violation of confidences because the INS had provided the Chinese government with a Chinese asylum-seeker’s asylum documents (Lin v. U.S. Dep’t of Justice, 2d. Cir., 2006). In these cases, the Chinese petitioner’s asylum rights were vindicated and supported. Six years ago, it may have appeared that fleeing Chinese citizens needed U.S. support. Compare a recent decision regarding another Big 5 asylum petition, this time from Ukraine. In Lyashchynska v. U.S. Attorney General, issued April 4, 2012, the Court refused to extend the same type of asylum and CAT protection to the suffering Ukranian woman, citing failures in credibility and evidence. Although the distinction of decisions might be clearer to an American attorney, one must wonder how such actions appear to Chinese government officials. In another recent case, Chen v. Holder (2012), a Chinese man facing removal proceedings claimed that China’s 2007 Country Profile did not properly reflect the changed country conditions of China. The Chinese man produced letters from family members recounting human rights violations and persecution, and alleged that the Department of State was intentionally working with the Chinese government to defeat family planning asylum claims. Faced with such a direct affront, the 1st Circuit Court denied the asylum claim. It appears that the post-recession courts may be changing their tune. Of course, recent changes in the U.S.’s attitude toward Chinese immigration may also reflect the March, 2012 release of Estimates of the Unauthorized Immigrant Population Residing in the U.S. In that recent report, the number of unauthorized immigrants coming from Asia had increased, while those coming from Europe had flat-lined. However, the report compares numbers from the year 2000 to the year 2011, and neither Europe nor Asia compared the the near doubling effect sustained from North America-born immigrants. Notwithstanding, there can be no doubt that after having surpassed Japan and Germany as the dominant economic contender on the global scale, China is on America’s radar; or maybe it’s the other way around. To be sure, Chinese-American relations will be the hotspot in international relations for the foreseeable future.